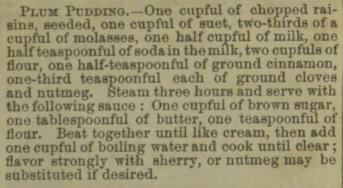 Plum pudding is a new recipe for me, and using a recipe from the year 1900 was especially challenging. The snippet from the Villanova Digital Library‘s December issue of “The People’s Home Journal” was scant at best. After reading Charles Dicken’s “A Christmas Carol” and after watching the 1951 version starring Alastair Sim, I was worried, like Mrs. Cratchit, that something would go wrong. Was there enough flour? Did I steam it long enough? I had to find the right cookware and ingredients, and after doing some research, I ordered a steamed pudding mold online and found a food store that has fresh suet. I also checked some trusted sources to fill in the blanks on the directions. My local natural food store allowed me to order fresh suet, which the butcher collected during her morning preparations. She didn’t charge me for it, but I’ve heard that some stores do. When I was ready to start the recipe, I first had to sort out only the very cleanest bits of suet. The next step calls for grating the suet or chopping it very fine. It was hard to work with so I decided to chop it. Now I had to figure out how to steam a pudding. Luckily, the Internet came to the rescue. I buttered the inside of the pudding mold generously, filled it with the pudding batter, and then placed it inside a large pot of boiling water so that the water was halfway up the side of the mold. It’s important to keep checking the pot to ensure that it stays at that level. I used my smartphone timer to remind me of the task every 20 minutes. 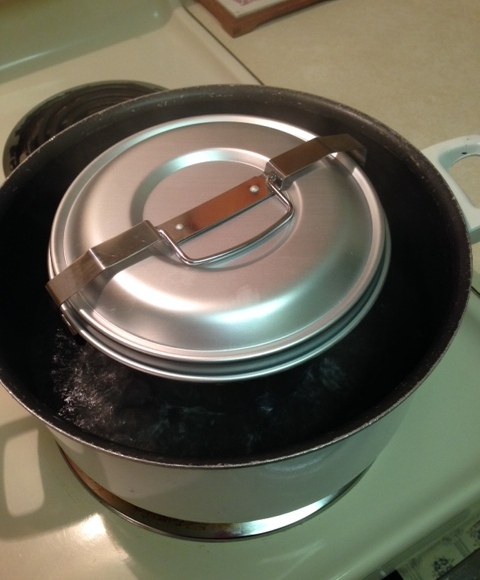 Also, when adding water, it has to be boiling, so I used an electric kettle to refill the steam pot when needed. 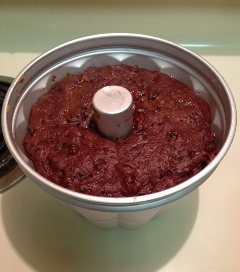 Since the pudding mold can’t be opened until the end of three hours, and because there wasn’t the slightest aroma in the house, I was almost afraid to open the steaming aluminum beast. It turned out well, and tastes like an intensely flavored gingerbread while the sauce leaves you with a buttery, sherry finish. Keep in mind, the pudding must be served warm. If you have the will power to save some, wrap it in foil and reheat later in the steam pot. By Luisa Cywinski, writer on the Communication & Service Promotion team and leader of the Access Services team. 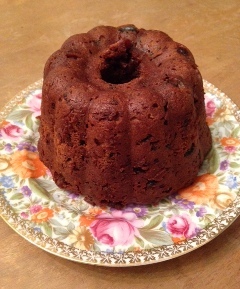 When my grandmother made a plum pudding, she used a large coffee can as the pudding mold, covered it with several layers of waxed paper (no aluminum foil in those days), and steamed it in a canning kettle. Sauce was similar to yours except seasoned with vanilla and nutmeg. Abampton: I would love to try that method! Could you share your grandmother’s recipe?